Digitization and reformatting of broadcast tapes to data file types such as H.264 MOV, Apple ProRes 422, ProRes HQ, AVI, MFX, H.264 MP4, etc. The customer can provide their own storage media, or purchase the needed flash-drive or hard-drive from Cintrex. Specify your desired return format when entering your order. Average turnaround is two (2) weeks from receipt into our lab back to your doorstep. Price is $40/tape. Quantity discounts begin at 10 tapes or more. Archived Backup Option - for an extra $5 per broadcast tape, we place a copy of the new digital format in Amazon AWS Glacier via LightJar (our own storage services product). Price covers 1st year storage only. We use professional tape decks with SDI, component, and IEEE 1394 connections tied into video ingestion software systems to provide high quality capture and transcoding to standard definition or high definition MP4 files; the final resolution corresponding to the original media's recording characteristics. 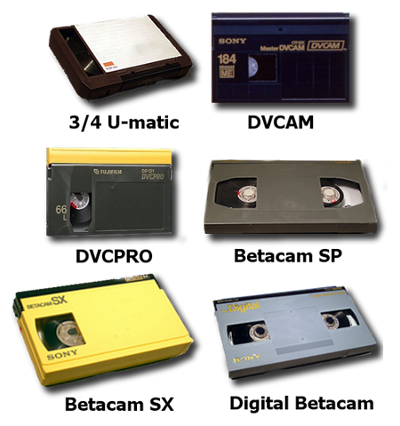 Our video tape conversion processes include cartridge inspection and repair, and tape cleaning. We return one (1) new data file for each video tape; and the files are initially labeled with the customer name, tape #, and sales order number. If you don't see what you are looking for, please contact us for a custom quote. We save all customer jobs for 90 days in our storage network for further editing, extra copies of discs, and protection against loss.